Child Brides, Global Consequences is a collection of two previously published CFR Working Papers on child marriage: "High Stakes for Young Lives" and "Fragile States, Fragile Lives." 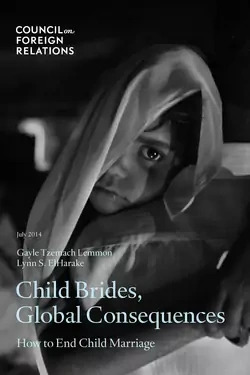 In "High Stakes for Young Lives," Senior Fellow Gayle Tzemach Lemmon and Research Associate Lynn S. ElHarake examine the social, economic, and cultural factors driving child marriage in order to help policymakers and civil society leaders curb, and eventually eliminate, child marriage. Since no single strategy will end the practice, Lemmon and ElHarake argue for a combination of legal frameworks, education policies, enforcement standards, attitude shifts, and economic incentives. "Fragile States, Fragile Lives" hones in on the correlation between child marriage and state fragility. Many of the countries with the highest rates of child marriage are found on the top of lists such as the Organization for Economic Cooperation and Development (OECD) list of fragile states and the Fund for Peace's Failed States Index, yet there is a wide gap in data that assesses the degree to which fragile contexts perpetuate child marriage. Lemmon writes that closing this gap will help produce more effective and targeted interventions to assist the youngest and most at-risk members of communities in crisis, and improve the future prospects of all members of the next generation in some of the most challenging corners of the world. This report was made possible thanks to generous support from the Ford Foundation, and is part of the Women and Foreign Policy program. For more analysis on child marriage, read the CFR report Ending Child Marriage by Fellow for Women and Foreign Policy Rachel Vogelstein and explore the CFR InfoGuide.